Those of you who know me, know I grew up in Austin, Texas. My dear friend Margeaux first took me canoeing on Lake Austin (now named Ladybird Lake) when I was in my early 20s. I was always very fond of canoeing the calm lake and seeing the city from a different view. 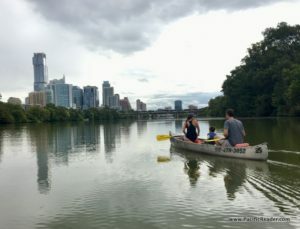 Each time I return to visit Austin I make it a point to canoe with whomever I’m traveling with. If you are ever in the Austin area I highly recommend you renting a canoe and exploring Ladybird Lake. There are several access points to rent canoes. My go-to place is located in Zilker Park at Zilker Park Boat Rentals. They rent old school canoes, kayaks, and standup paddle boards hourly or all day. I prefer the old school canoes because they are off the water and keep you the driest and can be even be used in the cooler months. Zilker Park Boat Rentals allow children of any age (provide lifejackets too) and even dogs. Reservations are not necessary, just show up with an ID and fill out their waiver. Rentals are subject to weather and lake conditions. 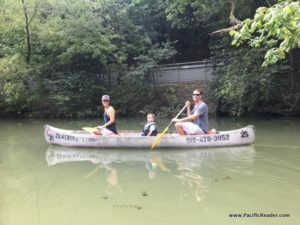 After you go canoeing it’s always fun to walk around Zilker park, take the kiddos for a train ride, or explore their extensive playground.